Short and sweet. There’s something to be said about a masterful economy of length. Long things, whether they are books, films, or albums tend to intimidate us. Our lives are all so busy and hectic, there doesn’t seem to be time for anything substantial anymore. Short can be sweet, but sometimes you have to kick back and ramble. Psychedelic Pill: like trippy Pony Express. At 67 years old, Neil Young should be slowing down. He should be basking in the glory of his recently published memoir, WAGING HEAVY PEACE. Young should be doing greatest hits concerts for $150 a pop to a sea of balding, gray heads. But Neil Young wouldn’t be Neil Young if he didn’t have a bit more on his agenda. I can’t believe it, but in 2012 Neil Young has released his finest record. Note that I didn’t say perfect or most commercial or the record I’d recommend to my friends; but PSYCHEDELIC PILL is without a doubt Neil Young’s finest record to date. It’s a wild and wooly album, full of long and intricate songs that manages to perfectly instill the very essence of Young. I don’t think that one double-album can totally encapsulate an artist as varied and masterly as Neil Young, but PSYCHEDELIC PILL does an amazing job showcasing why he still matters. These are not gentle, old-man-telling-you-a-story-from-his-rocking-chair songs. 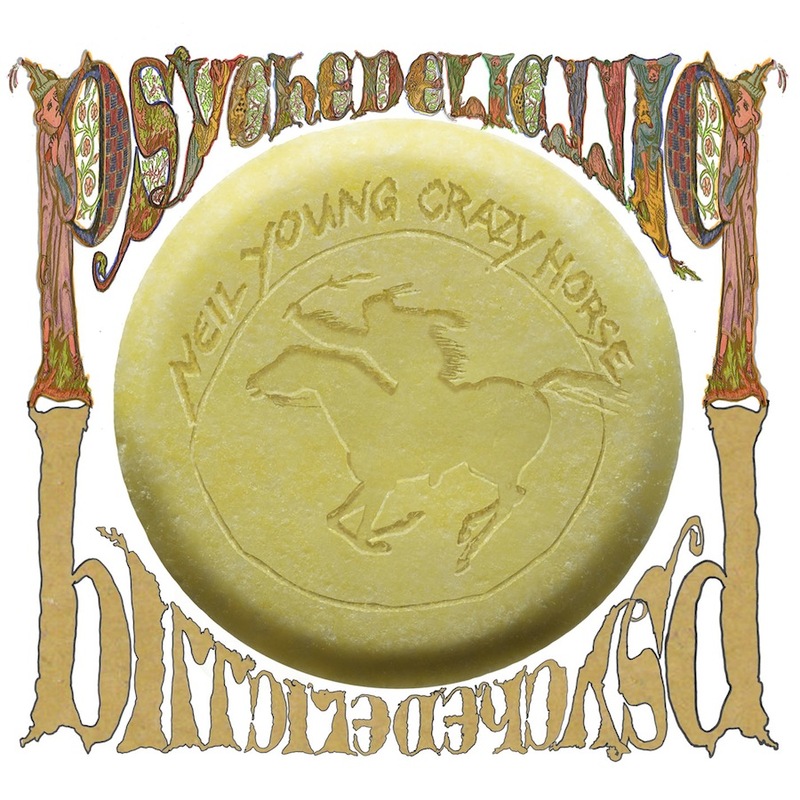 Neil Young & Crazy Horse are not in grandpa-mode at all on this album; PSYCHEDELIC PILL is a rocker. One of the reasons it’s taken me so long to write about this album is because it’s long and intimidating. The album opens with “Drifting Back,” a 27 minute-long song that’s acts as a kind of sonic air lock, decompressing the listener into the album’s atmosphere. Or perhaps a better metaphor would be that’s a time machine. I like that better because PSYCHEDELIC PILL sounds like lost 1970’s record, with the lengthy “Drifting Back” serving as a trippy time tunnel to the past. I can tell you that this album is a classic and will stand the test of time because it sounds neither vintage nor modern. Listening to PSYCHEDELIC PILL, it’s impossible to really get a feel for when it was recorded, that’s the very epitome of timeless. Immediately following the long “Drifting Back” we’re treated to the title cut, “Psychedelic Pill” which serves as a short palate cleanser of soaring, fuzzy guitar tones. It’s a welcomed gulp of pop before Young plunges us back into the lengthy “Ramada Inn.” That song, which focuses on the later years of an alcoholic, veers off into long tangents of guitar that walks the fine line between sublime and hypnotic. You either have the patience for this sort of stuff of you don’t. One wonders how autobiographical “Ramada Inn” is (Young is now sober after years of drug and alcohol abuse). Speaking of autobiographical, “Born in Ontario” and “Twisted Road” are two really great songs in which Young sings about his beginnings both as a young Canadian and as a newly minted songwriter hearing Bob Dylan’s “Like A Rolling Stone.” Both songs have a breezy, confident feel to them. “Twisted Road” has my favorite lyric of the album in which Young describes Dylan as Hank Williams “chewing bubble gum.” It’s a great line that never fails to make me smile, no matter how many times I hear it. “Twisted Road” is a bit odd because it’s strange to think of Neil Young as a Bob Dylan fan. Young and Dylan are like Gods, the thought of them being fans is a strange concept, though ultimately it’s very endearing. The best song on the album, in my opinion, is the moody “Walk Like A Giant.” Even though it clocks in at just over 16 minutes, I’ve listened to it dozens of times, and on each listen I’m blown away at how sonically diverse it is. In the song, Young sings “I want to walk like a giant on the land” as far as I’m concerned with PSYCHEDELIC PILL that’s just what Neil Young is—a giant, peerless and at the top of his game. It’s one long, strange trip that’s already become one of my all-time favorite songs: how can this be? Maybe I wouldn’t be so over-the-moon floored by this album if I hadn’t long ago written Neil Young off. Special mention should be made of Young’s famous backing band. People have criticized Crazy Horse over the years as not being a very “good” band. And to an extent I can understand that. They’ve always been a loose, almost garage-band kind of entity that might not work for every occasion, but here the band fits the material like a glove. I can’t imagine any of these songs without them, each track a beautiful sonic assault. Crazy Horse may be a blunt instrument, but they’re an instrument nonetheless, and here they’re utilized to great effect. Lastly, I’d like to encourage anyone reading this to give PSYCHEDELIC PILL a listen but keep a few things in mind. This album is about as anti-iTunes as one can get. This isn’t a take a few sips/try it out a little at a time kind of album, you need to commit to sitting down and listening to it. Yes, some of the songs are really long. Yes, it’s a bit indulgent in a few places (“Ramada Inn” and “Drifting Back” probably could have been trimmed a smidge). But overall it’s a fantastic album that every rock fan should check out. PSYCHEDELIC PILL should be heard in a dark room with headphones. There’s been much discussion of the lost art of album making, and I would argue that people have lost the ability to listen to an album. This is life changing, earth-shattering rock; have the decency to give it your full attention. Oh, man…I listened to about 2/3 of the new Aerosmith album when it came out. It was mostly to see *HOW* bad it truly was. Needless to say, I gave up and put ROCKS on.